When it's time to pay up, we'll make it as painless as possible. Paying Bills is never fun. GrowthForce does it efficiently while ensuring that you maintain control of who gets paid, and when. With our accounts payable outsourcing services, your bills can come directly to us or you scan and upload them, or FedEx them to us. Your dedicated service team will enter into a bill payment portal that is linked to QuickBooks®. You can review and approve bills on your phone, iPad or computer. We use technology to streamline your back office accounts payable process. We’ll scan the bills and link the scanned images to your transactions, so you have support for your auditor, tax accountant or anyone who needs to see the bills. We’ll also respond to vendor inquiries and process employee expenses. You always stay in control with multiple levels of approval. That means it’s less likely that your office manager will pay her utility bill with your check if the invoice is attached. And, it will no longer be easy for her to write a check to herself and change the payee to AT&T if a bill needs to be attached supporting the check. 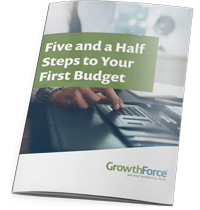 Five specific and manageable steps to starting your first business budget done in just a few hours.